With its origins in a desire to create a modern sans serif typeface, Foundry Sterling has a quintessentially English feel. The letterforms have been designed with special attention to proportion and purity of form, creating a functional yet eloquent typeface with a certain elegance and beauty. Foundry Sterling is an eminently versatile font having a carefully chosen weight range, which will be equally applicable for identity, signage and editorial use. The typeface family contains seven weights: light, book, book italic, medium, demi, bold and extra bold. Within the font package, as well as the traditional expert set, each weight has two main sets, with the choice of using either old style or tabular ﬁgures. 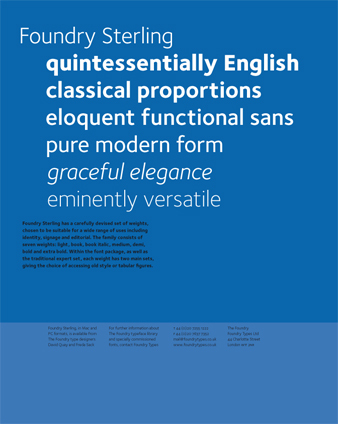 Foundry Sterling, released 2001 is more refined which is necessary for text use. It is strange how designers at a certain time feel a zeitgeist in the air while working on Foundry Sterling Jeremy Tankard, a very talented young English type designer released his excellent, ‘Bliss family’, much to my consternation. Foundry Sterling took a long time to get underway, Freda was for a long time very resistant to the idea of developing a typeface along the lines of Brunel and British Gas. During this time we took on an assistant, Stuart de Rosario, and between us we convinced Freda that we could do a unique typeface based on the knowledge that we had built up. In the meantime ‘Bliss’ was becoming very popular. Stuart was given the task of actually developing the fonts under our direction. It was much easier for Stuart to develop it as he had no previous involvement in the previous designs and could inject his own fresh ideas into it. He worked under our direction but as I was living in Wiesbaden, Germany at that time my input was minimal.